That is one great swag bag you got there Maxwell. Enjoy! Have a wonderful Wednesday. That is on LOT of birthday loot! Enough for THREE cats! Happy birthday Maxwell!! Have a great day...it looks as though it has begun with a bang!! Happy, healthy birthday, Maxwell! We love you, dude! Purrs, Ateret, Livia and Abbi. Kisses from Stephanie. We love that you are willing to share, Maxwell. You are such the gentlemen! Nope, no problem at all. Carry on! Gee it looks like there's plenty there to share BUT then again, when it comes to birthday prezzies - sharing is a BIT harder to do!! Doesn't hurt to try to sneak away with something though! Maxwell you are such a fine Brother to share and we send you loads of birthday wishes. Tee Hee! That happens here too! Whats yous is mine! 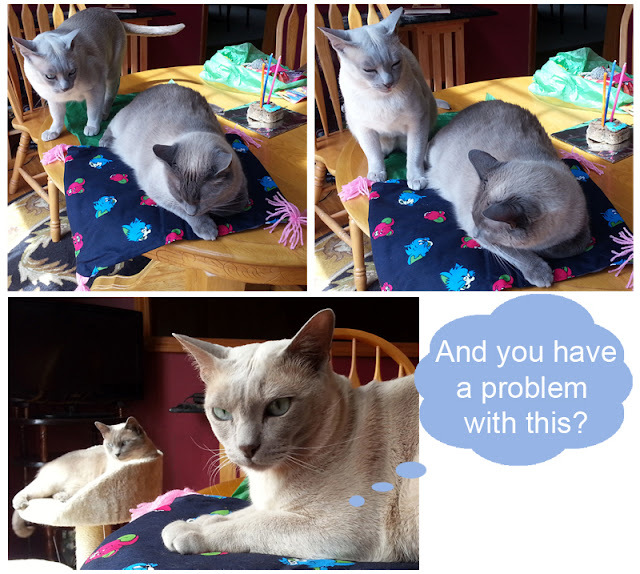 Really, Maxwell, you choose your battles well! Happy birthday! Happy Birthday Maxwell! 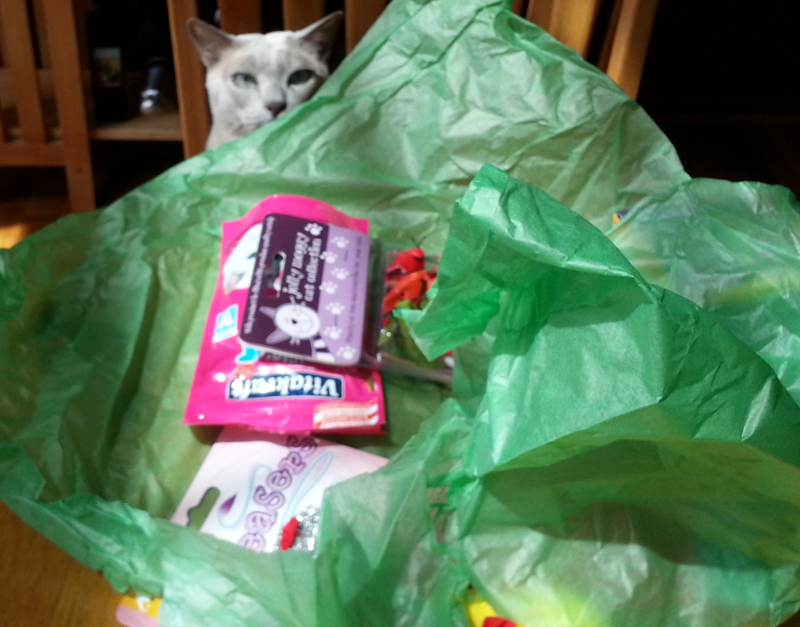 You have so many goodies I'm sure that Faraday and Allie would appreciate if you shared (a little)! Happy Birthday, Maxwell. We love you, buddy! Nope. You won't get an argument from us. We do the same thing to one another! That IS a lot of loot. BTW, today I was playing with the wand toy you sent me. Oh Faraday you are pretty sneaky, huh! 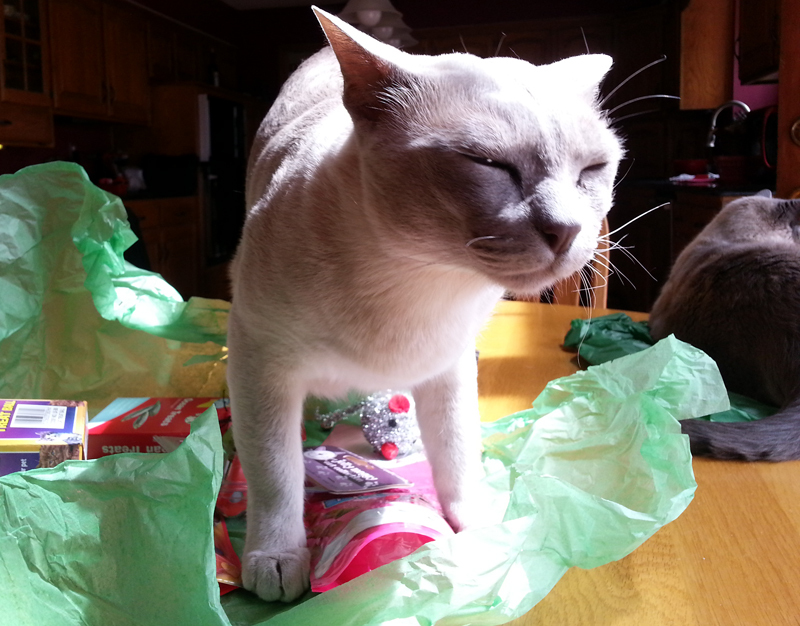 Did Maxwell end up sharing his great pressies with you? Faraday, that is a sneaky Binga trick! 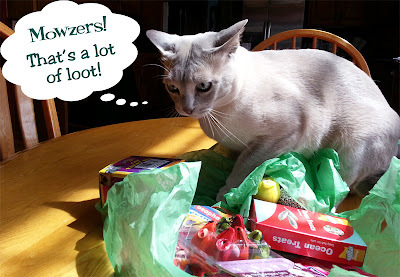 Dude, you gotta respect the loot.